PUR Gum assortment lets you try 6 flavors of gum that are free of artificial sweeteners like aspartame. It is, instead, sweetened with xylitol, a natural sweetener that comes from corn fibers produced in Europe. Along with being gluten-free, they are also nut free, soy free and dairy free making them a good sugar-free gum alternative for many dietary needs. The gum pieces themselves are small, rectangular and soft with a crisp outer shell similar to Chicklet gum and similar products. Each of the 6 bags contains 57 pieces of gum or 28.5 servings (2 pieces per serving). The bags are resealable with a zipper closure, making them a convenient package to keep in desks, lockers and larger purses and backpacks. Xylitol, gum base, natural flavors, gum arabic, glycerol, malic acid, citric acid, pomegranate powder, carnauba wax, tocopherols. A Note on Ingredients: Both food grade carnauba wax and tocopherols are deemed safe by the FDA. Tocopherols are actually a form of Vitamin E and serve as an antioxidant when used in skin care products. Both ingredients are given a 1-rating from Environmental Working Group which rates the safeness of ingredients between 1 (safest) and 10 (least safe/proven risk factor). While gluten-free gum isn’t exactly rare, there are brands that do pose contamination risks and do include gluten ingredients. 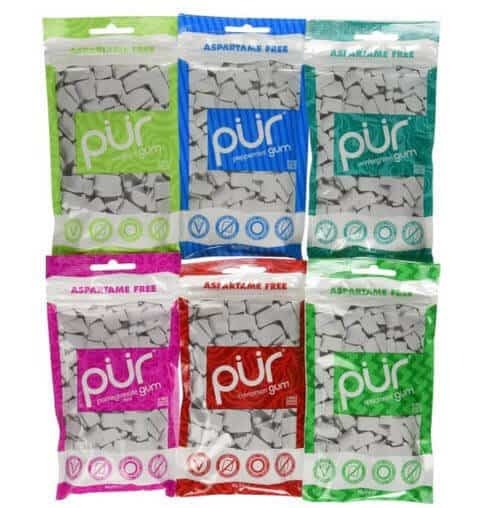 Pur gum not only satisfies the concerns of those who need to avoid gluten, but it is also good for anyone trying to break an addiction to unhealthy sweeteners, those with a nut or dairy allergy and vegans. Amazon reviews are overwhelmingly positive for all the flavors of the gum but even some positive reviews noted that the flavor doesn’t last terribly long. Overall this is a great alternative to the chemical-laden gums out there but keeps in mind that the flavor doesn’t last long and if you haven’t had natural gum before, the texture/how long it lasts might take some getting used to.